On the night of 21 November 1974, hundreds of people were drinking in two Birmingham pubs. It was Thursday - payday for many and the day for late-night shopping in the city. Young couples gathered for drinks and others, many at the start of their adult lives, jostled for their favourite spots at the bar. But in the space of five minutes, their lives were changed forever. Two bombs ripped through the Mulberry Bush and Tavern in the Town pubs, killing 21 people and injuring 220. More than 44 years later, inquests into the deaths have concluded the victims were unlawfully killed. Some of the survivors of the bombings have shared their stories. Image caption Maureen Mitchell would meet her then fiancé at the Mulberry Bush pub "most nights of the week"
About 50 people were enjoying a drink in the Mulberry Bush. The popular pub, located on the ground floor of the city's iconic Rotunda building, was a well-known meeting place and despite not being a weekend night, it was still busy - in 1974 Thursday was payday for many, and also the day of late-night shopping. For Maureen Mitchell, then 21, the pub was the perfect place to meet her then fiancé Ian Lord, as they lived on different sides of Birmingham. It was a place they would meet "most nights of the week" and that night they gathered at a spot underneath the stairs while Maureen, who worked in an advertising agency, told Ian about her work Christmas party "that he wasn't allowed to come to", she remembers. At the nearby Tavern in the Town it was a similar picture. By 20:00 the basement pub, close to the Odeon cinema on New Street, was about two thirds full, with around 200 customers inside. Among them were Carol Bates and Kevin Burgess. The teenagers, aged 18 and 17 respectively, had known each other for just three weeks and were on one of their first dates. An excited Kevin had skipped college early to see her. In 1974, the West Midlands was in the grip of an IRA bombing campaign. There had been 53 separate explosive and incendiary devices used between 1973 and 21 November. But the young couple had no concerns about being in the city centre. Indeed, Carol's father, who was a policeman, had advised her to be careful, but "there was no warnings or any feelings of anything amiss - it was a social night out", she said. After meeting outside the Odeon, they headed down to the Tavern, grabbed a drink from the bar and stood near a pillar chatting about Kevin's college work. Also inside was Les Robinson, then 22, who was a regular at the Tavern. It was "simply the best pub in Birmingham", he said. He remembers it being busy that night, and by 20:10, when he arrived, there were already many workers from the city centre shops - the "Rackhams crew", as he called them, after the city's department store. One of those workers was Carol Pearce, then Eaglesfield, who had finished her shift at the clothing shop Etams across the road and had met her friend Heather Turner for a drink. The pub was packed, remembers Carol, who then aged 18 was dressed in the fashions of the day - brown trousers with tights, a cream floral blouse and a long purple and cream tweed coat that reached almost down to her ankles. As they enjoyed their drinks that Thursday night, customers in both pubs were completely oblivious to the events that would unfold. What they were not aware of was that at 20:11, a man called the Birmingham Post and Mail newspaper from a telephone box. During the call, taken by a telephonist, he spoke of a bomb in the Rotunda building and one in the tax office in New Street, which was then located in King Edward House, part of a seven-storey building above the Tavern in the Town. The warning was accompanied with the code "Double X", the wording given with telephoned bomb warnings to distinguish them from hoaxes. The police were informed and officers were sent to carry out a search of the Rotunda. But just minutes later, some time between 20:15 and 20:20, two bombs went off. "I don't remember hearing anything," says Maureen Mitchell, who was in the Mulberry Bush as the first bomb exploded. "It was like the lights just went out and next thing I just felt as if I was - well I was - floating through the air. I don't remember hitting the ground again, then I remember Ian calling to me and I was just going 'my leg, my leg, I can't move my leg'. "I remember Ian calling to me. Ian was trying to get me up. There was a lot of rubble on my legs and he was trying to get that off." The blast in the Mulberry Bush was so violent that the 25lb (11kg) device left a metre-wide crater and blew out the staircase and bar. The interior of the pub was destroyed, the ceiling collapsed and broken glass, bottles, tables and chairs littered the scene. Other survivors told of seeing a "bright flash" and hearing a "very loud bang", while a passenger on a bus driving past the Mulberry Bush at the time of the explosion described the front of the building disintegrating and flying towards the vehicle. Maureen was carried away by a security guard from the Rotunda who laid her down outside the wall by New Street station, before she was put in one of the first ambulances that arrived. Others have spoken of crawling over bodies to get out of the pub. "I didn't think I would make it because my whole stomach was in a mess," Maureen said. "Once we got to the hospital they just took me straight to theatre and the next few days after that are quite hazy because I was in intensive care for five days." Shrapnel had gone through Maureen's hip and lodged in her bowel, part of which was removed. Her condition was so serious she was given the last rites. Some 150 yards away, the Tavern in the Town shook. It was only looking back that Carol Pearce realised this was the impact of the first blast at the Mulberry Bush. "We were sitting talking and the whole place shook. We didn't hear a bang, but it shook," said the mother of three. Unnerved by the sensation, Carol and her friend Heather decided to leave. Heather had already pointed out a man she thought looked suspicious, whom Carol says put down a holdall in the pub before disappearing. But just as they were about to go, everything went black. Survivors say there was a flash, smoke and then silence, before people started to scream and moan. "I don't remember the bang, I just remember the shaking of the pub and everywhere went quiet," said Carol, who was blown by the force of the blast into the neighbouring HMV shop. "I woke up amongst debris and dead people." Les Robinson described hearing a "roar". "It was inside you," he said. "I remember it was as though a big hand picked me up and I did a somersault and it threw me into the wall, and when I landed it had thrown me on the bottom of the stairs." The 30lb (13.5kg) device at the Tavern had been packed with large amounts of explosives, similar to the type used in quarries. It blasted a 3ft by 3ft crater through the pub's 10-inch thick concrete flooring, brought down the ceiling and flung debris up the stairs and out on to the street. Carol and Heather managed to struggle out, seeing a "sobbing policeman" who helped them flee, and they were taken to the General Hospital. Carol had serious burns to her legs - the tights she had been wearing under her trousers to keep herself warm in the November weather had burnt to her skin - shrapnel had torn a hole in her back, she had burns to her face, hair and hands and both of her eardrums were perforated, leading to lasting hearing problems. Her friend Heather needed a blood transfusion and had burns to her face. The pair spent a short time in hospital together, but after that night lost touch and would never see each other again. The blast knocked Kevin Burgess off his feet. "I called out for Carol, she answered, we got together, got ourselves up," he said. "It was darkness, that's what made it surreal. The screams, people's voices of agony - you could see very little because it was all black and you were stumbling around." "We realised that the wall and pillar behind us had come straight down behind us and the back wall had been blown out, which in effect turned out to be the only way out as the stairs had blown up," remembers Carol Burgess. The pair started to help others out and were forced to climb over people, "listening to the screams and making our way out of the pub", Kevin said. They had suffered mostly superficial injuries - cuts, bruises and hearing loss - for which they were treated at the General Hospital. The blast had blown "glass, wood and everything else" into Les Robinson's body. His trousers were ripped off and the nylon jumper he was wearing had melted to his shoulder. "I couldn't see a thing, obviously all the lights had blown," said Les, who worked as a Co-op Dairy plumber. "We couldn't hear anything because of burst eardrums, the only thing that really worked was your smell. "Although I didn't know it at the time, but it was the people who had been burned. My whole leg had been burned, all my hair had burned off, I could smell me, I could smell everyone and then I thought: 'I've got to get out of here'." Despite his injuries, Les managed to make his way out of the pub and struggled the mile-and-a-half journey home, clinging to parking meters and cars to support him along the way. Image caption Les Robinson described the Tavern as "simply the best pub in Birmingham"
Outside the Tavern there was "uproar". People staggered or were carried to the Magnum Hotel opposite, some screaming, some just waiting to be taken to hospital. But the realisation of what had happened was yet to hit them. "I don't think anyone in the whole pub knew what it was," said Les. "Last thing on my mind was a bomb, a terrorist bomb." Carol Burgess added: "We didn't quite believe it to start with. You know these things go on but you don't believe it could happen to you." A total of 21 people were killed by the two bombs. Nineteen died on the night - eight in the Mulberry Bush and nine in the Tavern in the Town. Two more died later from their injuries. The seven women and 14 men killed were aged between 16 and 51. Thirteen of the victims were under 30, including five in their teens. Some 44 years after the pub bombings, no-one has been convicted in connection with the atrocity. Six men were wrongly jailed but finally released in 1991. During the near 17 years they spent behind bars, the case of the Birmingham Six became infamous as one of the worst miscarriages of justice seen in Britain. 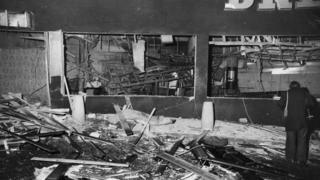 The Irish Republican Army (IRA) carried out the bombings - a third device was planted near the Barclays Bank on Hagley Road but failed to detonate properly. For the survivors, life has gone on, but the events of that night have never been forgotten. 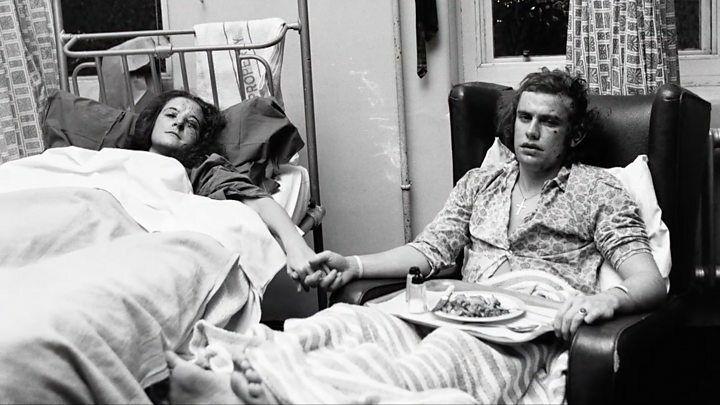 Despite her injuries, Maureen slowly recovered and she and Ian married seven months later, although the couple would go on to divorce. "I've always tried not to be bitter because I always felt that being bitter wasn't helping me or anyone else." The bombings made Maureen "appreciate life more" and she became involved with peace and reconciliation work. She suffered from survivor guilt, but said meeting others bereaved and affected by the Troubles had helped her cope. And while she bears the scars from her injuries "physically they don't affect me in any way", she said. For Les, now 67, the impact of that night means he cannot be anywhere near an unattended parcel. "Even to this day it gives me the most uncomfortable feeling in the world. I will ask if I'm in a place with an unattended bag, I will ask whose is that bag and if I can't find out I'm out of there." But he says the events enabled him to "meet and marry the woman that I did". "Her name is Roz," he said. "Roz was in there as well that night. We'd fell out so weren't really together - like all courting couples you have your moments - but it got us back together. "From there we married, from there we had the two best daughters you want and a further three grandchildren. It made my life. The Tavern didn't take away anything from me, but it gave me everything." Carol and Kevin Burgess, who had been on one of their early dates, went on to marry. The bombings "brought us closer together", says Kevin. But 44 years on, both say they remain wary of travelling into the city centre. Over the years Kevin suffered flashbacks and found it difficult to accept that he escaped with relatively minor injuries. "I was very, very lucky," he said. "People lost arms, legs - died. Why wasn't it me? That's affected me over a number of years." He added: "The one thing that will always stick with me for the rest of my life is the smell of flesh, hair. That will never ever go from me." Carol Pearce became a Christian "that night", she says. She later befriended a girl in her street and was a bridesmaid at her wedding. The best man was Roy Pearce - whom Carol, now 62, went on to marry. The couple have been married for 42 years. "For me, everything changed because if I hadn't have been in the bombing I don't know what would have happened, but I certainly wouldn't have met Roy, but I did, so things changed dramatically," she said. The couple took over running a youth club and then she ran an arts and crafts charity and did play scheme work. While she did not go back to her job at Etams, and trips into the city centre became infrequent, in 2004 she would return to work in the centre of Birmingham as a receptionist at the National Trust's Back to Backs attraction, a "big step" that eventually gave her the confidence to travel into the city on her own. "I've thoroughly enjoyed my life," she added. "I'm grateful for the life I've got."